We work on a lot of modern motorcycles. 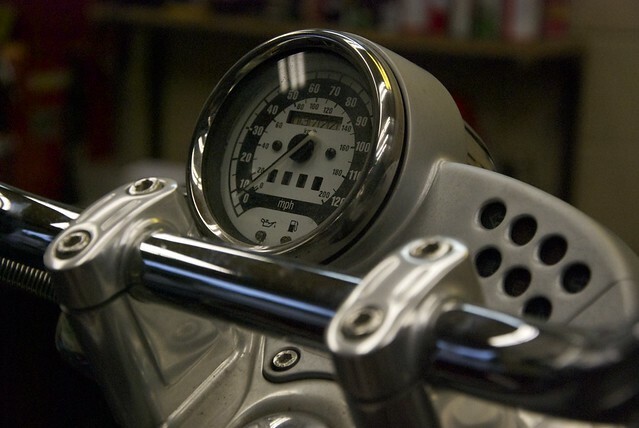 We talk about vintage Japanese and European motorcycles much of the time, but modern metric is also a big part of our repair business. Most of the time, it’s the same sort of tune up and maintenance work we so often do on vintage machines. Every once in a while though, we get a weird one. 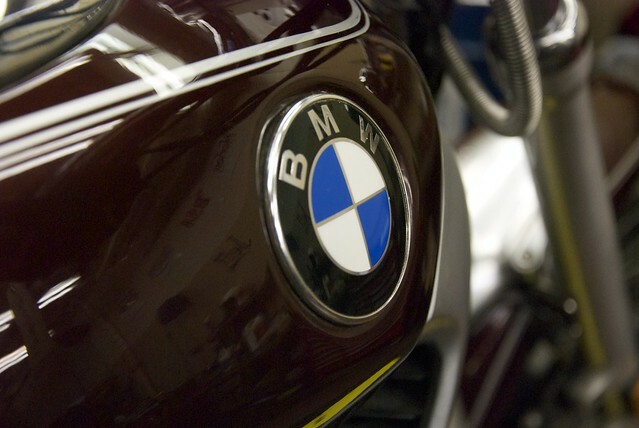 This BMW K1200 is not simply a unique example of Munich’s iconic opposed twin. It came to us under strange circumstances. This is a cautionary tale about what sorts of things you ought not to go looking for on Craigslist. When this bike first rolled through our door, it looked like it’d been stolen off the assembly line before reaching the end. Pieces were missing. It didn’t run. Making it whole again would be no small undertaking. BMWs haven’t been simple machines for a good half century now. These modern, fuel-injected machines have computers onboard, anti-lock braking systems, and even the mechanical systems are complex. Just look at that front suspension! Working on them is not for the faint of heart and certainly not for the inexperienced, even when all the parts are actually there. 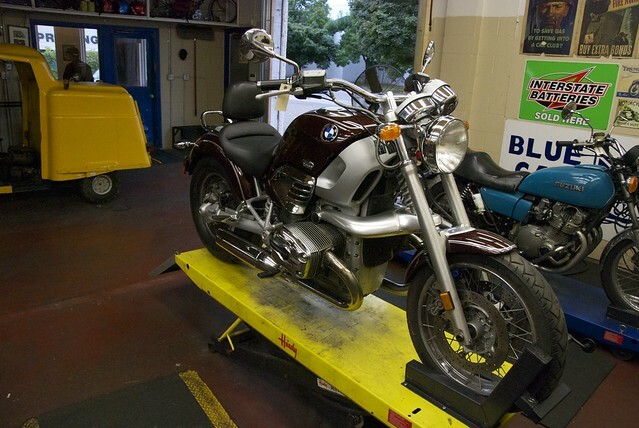 This bike’s owner had looked to Craigslist for someone to help him get this modern beamer back on the road. Work began, but never finished. The bike didn’t run, the Craigslist mechanic was nowhere to be found, and there were parts missing. Expensive parts. So as often happens, we found ourselves in the position of picking up where somebody else left off. Sometimes it’s a well-intended owner. Other times, it’s another mechanic or shop. In this case, we were picking up in the middle of a mystery. Something was afoot. The whole situation seemed shady given the missing parts and the AWOL Craigslist mechanic. Should someone be mounting a man hunt? We’re not bounty hunters, so we let the owner keep trying to relocate the CL mechanic and we set about fixing the motorcycle. Robb has become our go-to resurrection specialist, so the maroon and silver BMW ended up on his bench. He began un-gunking the fuel system and resetting all of its electronics. This was no simple task, given that critical components such as the left hand controls had wondered off with the absent Craigslist mechanic. Thankfully, it’s exactly the kind of guerilla wrenching Robb is so good at. Obscure German cruiser with a bunch of parts missing? Sure, he can get it going again. Enough time and Diet Coke, Robb can fix damn near anything. Thankfully though, this story has a happy ending. 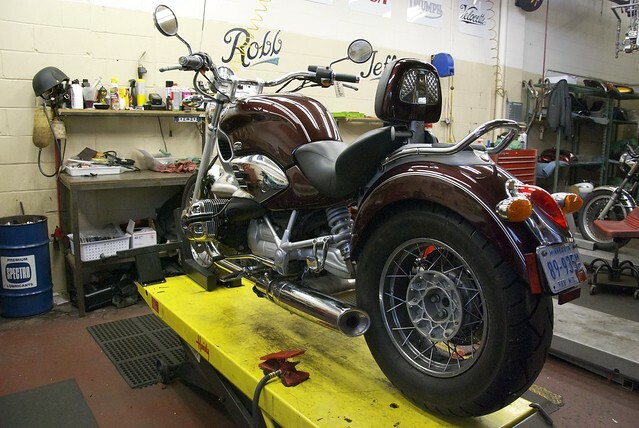 Robb was able to not only get this gorgeous-if-strange BMW back in running order, but the owner was finally able to get ahold of the Craigslist mechanic and retrieve his missing parts. It took weeks of trying to track him down, but this was time well spent on several fronts. Firstly, it saved our new customer several hundred dollars in replacement parts. As brilliant as these German machines are, the parts don’t come cheap. More importantly though, we were able to get his machine fully sorted out and back on the road. The moral of the story is simple. Get your bike fixed on Craigslist at your own risk. More often than not, it’s dime wise and dollar foolish. Instead, come see us first. Save yourself a little cash and a lot of drama.